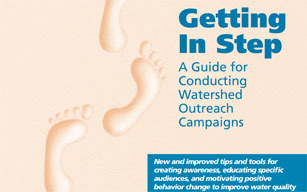 The EPA's Getting In Step: A Guide for Conducting Watershed Outreach Campaigns guide provides the tools needed to develop and implement an effective outreach campaign as part of a state or local, water quality improvement effort. Whether you’re charged with developing a watershed management plan to restore impaired waters or protecting your local water resources for the future, this guide will help you understand the importance of reaching out to people and motivating them to act. Includes more specific information on how to work with the mass media to conduct an outreach campaign. Provides new information on how to incorporate social marketing techniques into your campaign to generate sustainable behavior changes that will protect water quality. Teaches you how to listen to the needs of your audience rather than just blindly handing out fact sheets or reports that sit on shelves and collect dust. Shows you the important roles that audience research and program evaluation play in changing personal behavior. Helps you to determine the most effective vehicle to reach the target audience and motivate behavior change through the step-by-step approach to social marketing and outreach planning and implementation.